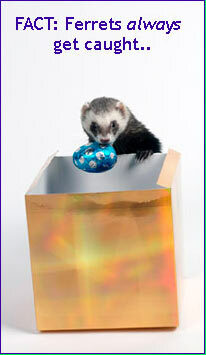 A ferret having fun means shuffling backwards at great speed whilst staring madly and showing lots of teeth. The only problem with this activity is that the ferret is often so engrossed that when it's time to run away they often collide with the nearest door/wall. The dance is sometimes accompanied by chuckling (this is called dooking). 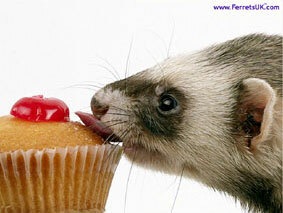 Ferrets have very short digestive tracts so they use up the energy they get from food really quickly. Ferrets sleep curled up - sometimes with all paws in the air. Ferrets when they start to wake-up sometimes shiver. Paws and the rest of the body shake to regulate body temperature which can drop while ferrets take a snooze. Ferrets tend to wilt in the heat as they cannot sweat. If the weather is hot make sure there's plenty of fresh water and shady spots. A cool floor area can be created by placing a large ceramic/marble tile on the floor for a ferret to flatten out on. An ice-cube in the drinking water also helps. The ferret is the 3rd most popular pet in the US.